1Department of Biotechnology, Jamal Mohamed College (Autonomous), Trichy, INDIA. 2Department of Biology, Kau University, Jeddah, K.S.A. Objective: In the present study, the bioactive components present in the ethanol stem extract of Clausena anisata was analyzed by using Gas Chromatography Mass Spectrometry analysis technique (GC-MS). Clausena anisata, a medicinal plant belonging to the family Rutaceae, is represented by 20 species available in India and used traditionally for the treatment of several ailments but there is a requirement to identify its phytoconstituents, its target, mode of action and treatment using plant products either alone or in combination with synthetic drugs. Methods: Clausena anisata stem was procured from Manamettupatti, a village of Pudukottai District, Tamil Nadu. The shade dried stem was powdered and extracted using ethanol by maceration method. One microlitre of the extract was subjected to GC-MS analysis to detect the presence of bioactive compounds present in the stem of C. anisata. 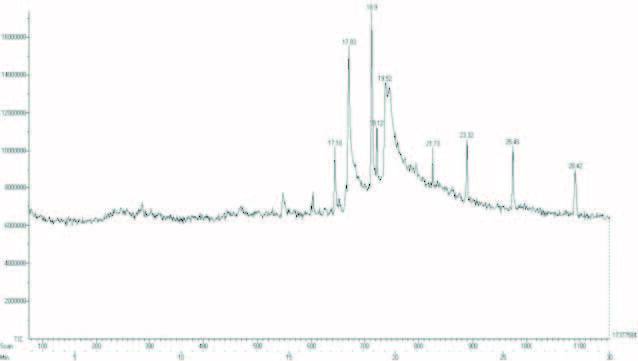 Results:The results showed that the ethanol stem extract of C. anisata contained nine bioactive compounds, of which the major one is n-hexadecanoic acid (78.54%), followed by 8-octadecenoic acid, methyl ester, [E]- (6.638%). The total number of compounds obtained was compared with National Institutes of Standard and Technology (NIST) library that contains more than 62,000 known compounds based on retention time and molecular mass. Conclusion: In this study, nearly nine compounds have been identified from the ethanolic stem extract of C. anisata using GC-MS analysis which was mainly composed of fatty acids and sterols. The GC-MS analysis is used to understand the nature of active principles present in this plant revealed that the plant can be used as a potential source of new useful drugs. Yakoob AT, Tajuddin NB, Mathew S, Hussain MI, Qadri I. Gc-Ms Analysis of Ethanolic Stem Extract of Clausena anisata (Willd.) Hook F Ex Benth. Pharmacognosy Journal. 2016;8(6):576-578.